Instead of one hour of questions, we have three crazy nights. So do Meaple, Dan Wayne and Ben Wayne, when he’s not off playing with his strudel. Trevor and the Iversons are there, enjoying five-meat chili with chicken. Put them together, what a fine hacker crew! The owner of the Ford Festiv-ia celebrates Trivia. Oz and Eck, not Norwegian! But guess who is... Raygor and his six centimeter pubic region (he converted). Leah is actually Norwegian - not too shabby! Well, hes not, but guess who is: Neil and his chocolate salty balls-is. Scuba Steve isn't, but I heard his brother Boitano is. I hope I don’t get Chlamydia, at this lovely, lovely Trivia. If you really, really wann-ia , Have a happy, happy, happy, happy Trivia! The Powers family has once again graciously invited us back this year (unanimously too! ), so let's be on our best behavior. A duty roster spreadsheet will be circulated shortly; please sign up, but only meals/cleanup that you are certain you can be there for. Nothing throw a wrench in the system like Dan signing up for 4 am trash duty and being in a coma. Speaking of Dan-Dan-Mono-Dan, he has really shown up this year with a sweet Trivia logo (see attached) - if you would like a shirt made please reply with the size(s) ASAP. Looks like we will be doing the blend T-shirts again, probably navy/heather blue. Cost is generally in the $15 range. See you all in a few weeks, and let's get Trivia-ing.. Triving..Tri-vi-a-ing. That. 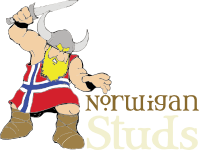 Copyright © 2013 The Norwigan Studs. Web hosting generously donated by Algenta Technologies.